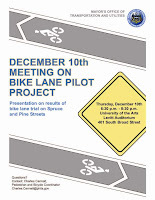 Greater Philadelphia Bicycle News: Reminder: Spruce Pine Bike Lane Meeting Tonight! Reminder: Spruce Pine Bike Lane Meeting Tonight! The Planning Commission and Mayor's Office of Transportation is holding a public meeting on to deliver the results of the Spruce/Pine Bike Lane Pilot Project. We want to fill this meeting with supporters of the Spruce/Pine Bike lanes. Please come to the meeting and hear about the results of this pilot program!